After signing the Paris climate agreement, the Dutch national government is investigating the consequences and opportunities this has. When the Netherlands are energy-independent and 95% of our energy use is harvested in a renewable way, what would be the spatial effects? 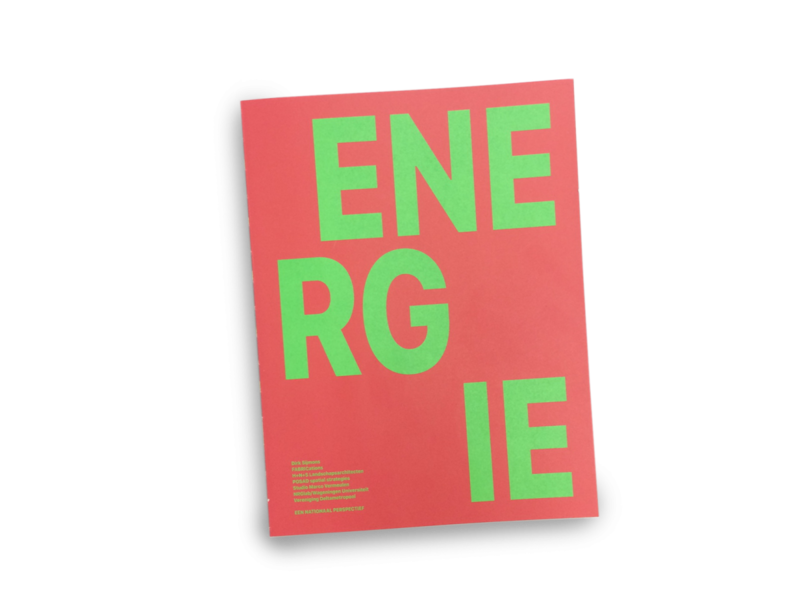 The publication ‘Energy and Space – a national perspective’ is a first attempt to figure out how and where to harvest heat, wind and solar electricity in the Netherlands. Based on energy consumption models for 2050, a ‘shopping list’ for the dominant energy commodities heat, fuel and electricity use was divided into different ways of harvesting, resulting in an assignment per harvest application. 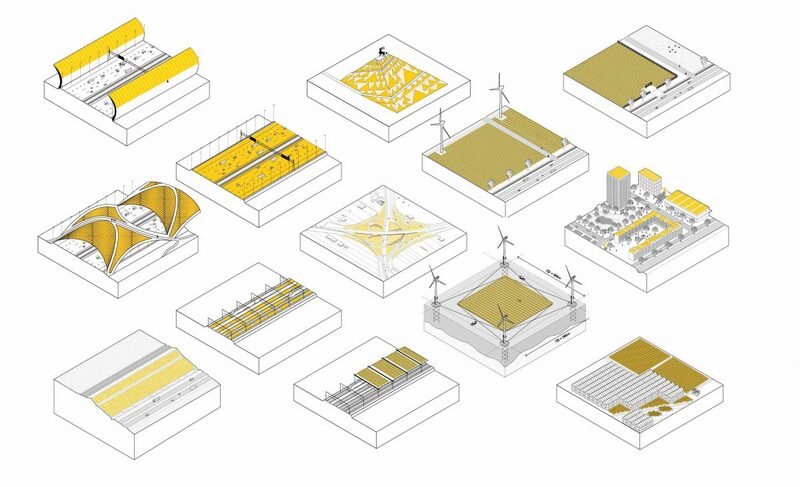 Spatially, the challenge lays in the gap between the large, nationally planned energy infrastructures like wind parks in the north sea, and almost autonomous developments like solar roofs on private buildings. In terms of electricity or heat production, this gap accounts for around 25% of the total production requirement. A series of so called ‘National energy landscapes’ could be introduced in order to meet this challenge. Where solar energy is an inherent low-density and decentral form of electricity production, the result on national level is very scattered: besides the low hanging fruit like roofs and solar farms, possibilities lie around infrastructures, floating on water basins or on vacant lands. For wind energy, the challenge is in harvesting as much as possible on the sea, but also to find proper integration with vulnerable landscapes in the Netherlands like the Veluwe, the IJsselmeerpolders or the river landscapes. Heat is an infrastructural challenge since geothermal potential is not necessarily close the consumer. A network on national scale will be necessary to bring supply and demand together in a robust and resilient way. 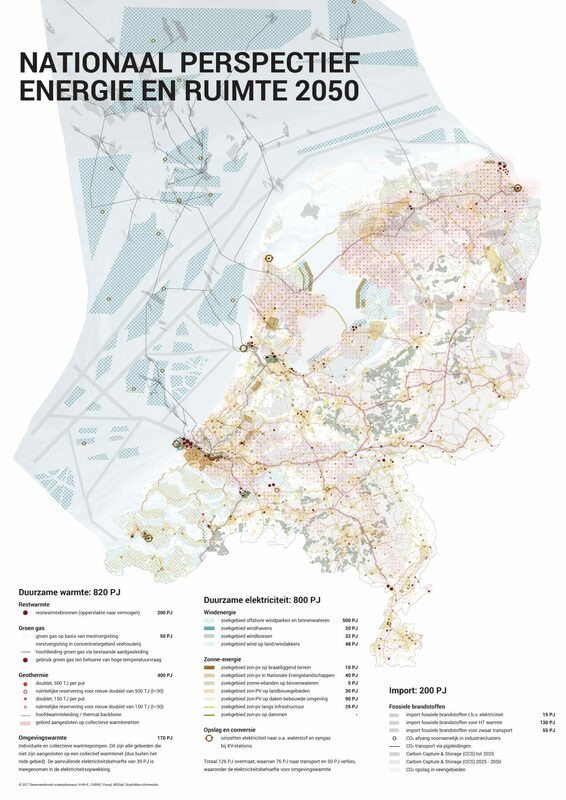 Altogether, the energy transition will be visible in every corner of the Dutch cities and landscape. This first ‘perspective’ opens the debate on what are the steps to get here, and point out several spatial challenges that need to be further elaborated on a regional level. The National Perspective Energy and Space shows electricity- and heat production on land and sea. In some areas, for instance around the metropolitan region of Rotterdam and in the north of Groningen, energy production will dominate the landscape. The image below highlights solar energy. Solar energy is inherently a decentralized and very scaleable form of electricity production. Several indicators define however where it is logical to start, eg. areas with higher average solar radiation. Overview of the large amount of integration possibilities for PV Panels. Besides roofs and on agricultural land, large opportunities are around infrastructures and floating on water basins or lakes.